Get all the space you need for storing large volumes of food and beverages with a commercial walk-in cooler from CKitchen.com. These high-capacity coolers are essential for large-scale food service operations — bars, restaurants, catering companies, supermarkets, concessions, Healthcare and more — and are also an essential for florists and other businesses that need to keep inventory fresh. 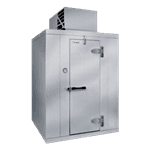 We have commercial walk-in coolers and freezers for every budget and environment, with a low-price guarantee on styles by Kolpak, Master-Bilt, Nor-Lake and more. These are the best brands in commercial refrigeration, so you can expect long-term quality. Our walk-in refrigerators are designed for total convenience as well as efficiency. Upgrading to a brand-new commercial-grade walk-in cooler can help shave a ton off your monthly energy bill while reducing costs associated with maintenance and upkeep. Newer styles feature components such as adjustable hinges, gaskets and latches that help prevent loss of cold air, which ensures easy-running efficiency for the long-run. They also have safety features to prevent employees from getting locked inside, and have efficient interior lighting and custom shelving options so that you can build a configuration that perfectly suits your inventory needs. At CKitchen.com, we can help you find cutting-edge walk-in refrigerators that suit your unique environment. We have top-mount, side-mount, and remote walk-in refrigerators to accommodate your particular space. What’s the difference? The packaged system requires no HVAC technician, whereas the remote system requires an HVAC technician for connection. Remote installation helps reduce hot air from blowing into the unit, which can compromise efficiency and reduce comfort for employees. Top-mount walk-ins are self-contained and often have the evaporator coil inside the cooler itself, which can reduce the amount of usable space available. Side-mount walk-ins have the evaporator coil on the side, which may also compromise some interior space. With that being said, side-mount styles are great for rooms with low ceiling clearances. CKitchen.com is always available to help you determine which walk-in cooler is best for your needs.